Articles written for Kuro5hin.org, osOpinion.com, and occasionally Slashdot.org. but added links (marked "[CACHE]") that point to copies I pulled from Google's cache. at osOpinion.com won't work at all, unfortunately. 06.04.03 From its humble beginnings as an idea I had last year, the Open Data Format Initiative has now become a full-fledged web site, where I offer my commentary on the philosophy of ODFI, discussion of various open source bills, and lots of other good stuff. The coming out party was today, when I picked up a link from slashdot (submitted by myself). 05.08.03 A discussion of Microsoft Bloggers and how they might affect the future of blogging. This article was voted down when I submitted it, so I posted it as a diary entry (perhaps appropriate for an article on blogging). Interestingly, many people who read this thought that a) I was a blogger, b) I thought Microsoft was evil, and therefore c) the article was just a long whine about how Microsoft was going to ruin everything. In fact a) and b) are false, and I am neither particularly for, nor particularly against, this scenario (which is only a possibility anyway). I do think blogging needs to grow up and get over the fantasy that it will replace old media. 04.23.03 I wrote a slashdot review of the book How Would You Move Mount Fuji? Microsoft's Cult of the Puzzle - How the World's Smartest Company Selects the Most Creative Thinkers (that's just the title, not the whole book) by William Poundstone. "A marvelously balanced and well-reasoned piece" says the author, the review generated 1175 comments at last check (only 11 of which were rated -1), and the amazon.com ranking for the book jumped from 11,722 to 29. 04.04.03 I posted an update to my story T.E.U., an improvement over the original version. Many positive comments, including a few suggesting I write a sequel. A few links, including Fubar by Furia, Both Barrels, and Netalive, and badsoda (look under April 11 -- permalinks are broken on that site). 01.02.03 I start the new year off with some speculation on What the Future Holds for Microsoft. An idle comment about Linux being hopeless on the desktop generates a significant portion of the discussion, but some interesting back-and-forth in there. The Guardian Online's blog says "...doesn't mean it's all necessarily correct, only that it provides a lot more insight into the reality of Microsoft than most of the junk that gets published." 12.13.02 I wrote an article a while ago called "Can We Improve Computer-to-Human Bandwidth?" for osopinion, but never submitted it. I wound up posting it as a comment on slashdot. 11.19.02 To support a new magazine for Princeton alumni called The Princeton Independent, I produced a 6000-word opus on Nunavut, the new territory covering Canada's Arctic. The magazine is currently online-only, but did not include any links, so here are some: the Government of Nunavut, the Indian and Northern Affairs Canada Nunavut index, the Nunatsiaq News newspaper, and a few of the publications I reference in the article: Colin Irwin's report "Lords of the Arctic, Wards of the State" (with responses), the Nunavut Broadband Task Force report (PDF), and the Conference Board of Canada "Nunavut Economic Outlook, May 2001" (PDF). 09.21.02 I compare Weight Watchers to the Atkins Diet, a typical low-carbohydrate diet. It seems nutritionists are starting to believe that the benefits of the low-carb diets can outweigh the negatives. 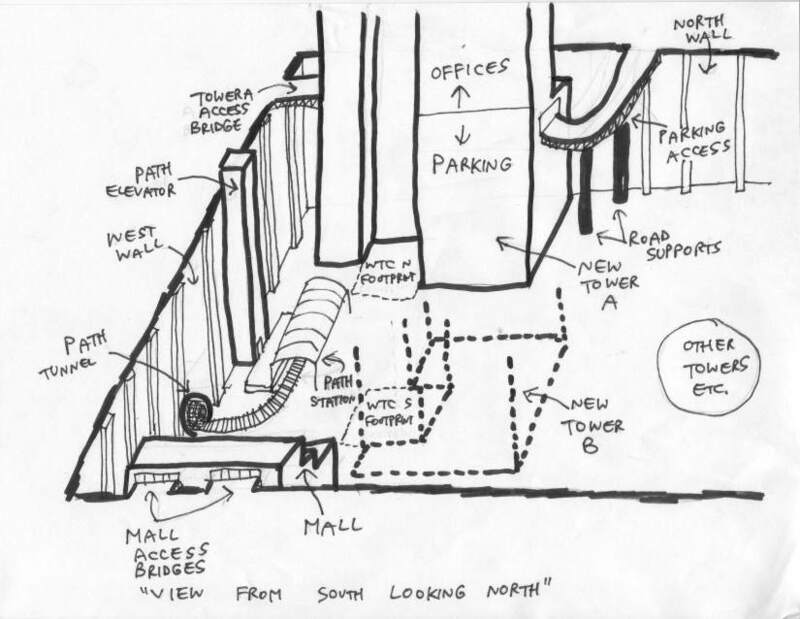 08.29.02 Here is my proposal for redesigning the World Trade Center site, the key point of which is preserving the visual impact of the "bathtub" that was revealed when the foundations were cleared away. Check out the drawings I did (south looking north and east looking west). 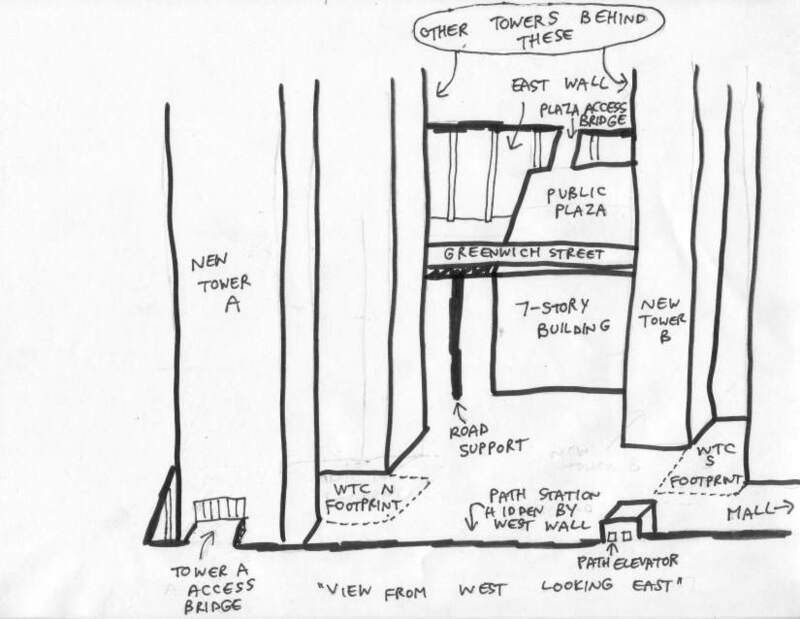 This idea seems to have been picked up by a few of the current proposals on the Lower Manhattan Development Corporation's website. 08.09.02 I discuss how I think Microsoft shifting revenue backwards isn't really morally superior to shifting it forwards (a la Worldcom etc), but nobody seems to have picked up on this. 07.24.02 On a non-computer-related note, I discuss that what people are looking for in the suburbs might actually be better found in cities. 07.09.02 OK, back to kuro5hin...this is a little history of TCPA and Palladium, in which I blame most of it on Microsoft's fear of Sony. This article was linked to by several places, one of which was Ross Anderson's somewhat alarmist TCPA/Palladium FAQ. 05.28.02 With all the fuss over middleware these days, it's not clear there's much to get excited about (part 1 [CACHE] and part 2 [CACHE]). Nobody is making any money off of middleware these days, and nobody has any plans to make money, so who cares who controls any particular language/media format/instant messenger protocol/whatever. The discussion about this article included canonical versions of the Microsoft was mean to Apple and Microsoft was mean to Digital Research arguments. 05.01.02 Bill Gates insisted during his testimony in the nine states antitrust trial that modular Windows was impossible without a lot of work. But what about Windows XP Embedded, which would appear to be a modular version of Windows? Well, it's not quite that simple [CACHE]. This article was linked to extensively, including some actual discussion. 04.19.02 After seeing the movie Revolution OS, I whipped up a review for slashdot. "The film by J.T.S. Moore is about the growth of the free software movement, and its eventual co-option by the open source movement. I don't think that's what the movie was supposed to be about; it was supposed to be about Linux and its battle about Microsoft. But the movie is quickly hijacked by its participants and turned into a theoretical discussion, in which Linux itself is a mere sideshow." 04.09.02 I talk about how Microsoft is still baffled by Unix [CACHE]. The company keeps doing dopey things when competing with Unix. I discuss who is to blame for this, the developers or the program managers. HINT: I was a developer. That is not a typical Microsoft marketing person on the cover of the book there, but it might as well be. 03.26.02 I discuss source code and patents (parts one [CACHE] and two [CACHE]), making the basic point that if you want to see the former (which I do), you are going to need to allow the latter, but that you can require the former with the latter (got that?). Also, that the data structures and algorithms behind software (the type of things that are patentable) are much more valuable than the actual source code (which is copyrighted). So let's see that source code folks! "The first opinion piece I’ve seen on the site in a long time that was worth a damn," said one reader. 01.29.02 My latest scheme is the Open Data Format Initiative [CACHE], a plan to "encourage" all software companies to document any data formats they use to store user data. This does not mean that companies will have to adopt any standard format, just document the ones they use. Let me repeat, this does not mean that companies will have to adopt any standard format, just document the ones they use. As you can see, the lobbying has begun! This post was discussed at InfoAnarchy and LinuxToday. 01.18.02 When reports of Bill Gates' security memo first came out, they claimed that one of the provisions was that employees reviews would be based in part on their ability to write secure code. I felt although the rest of the memo was mostly fluff, that one point showed Microsoft was finally getting serious about security [CACHE]. Of course in the end it turns out that those reports were false, which proves that Microsoft is actually not yet getting serious about security. 01.08.02 Inspired by articles claiming that the future of the Internet must include micropayments, I make my case that in fact micropayments are a crock [CACHE]. My article was linked to by TechDirt, which feels the same way. The drawing there on the left, incidentally, was blatantly ripped off from a cartoon by Scott McCloud, a two-parter in favor of micropayments. By way of micropaying for using it, I will put in a plug for his meta-comics, they are both excellent. 11.07.01 I look over the proposed settlement of the Department of Justice to examine open source and enforcing the agreement [CACHE]. "A close look at the agreement reveals more than one loophole and back-door provision that could either limit -- or enhance -- the role of open-source contributors in enforcing the deal." Also discussed on LinuxToday. 10.29.01 I make the point that most of the new features in Windows XP are really just bundled applications [CACHE]. In a comment about this article, I emphasize my most important point, which is that just because the U.S. Appeals Court said the Internet Explorer bundling was OK, Microsoft shouldn't necessarily get to throw in the kitchen sink. 10.23.01 Triggered by a Microsoft employee bitching and moaning about people who publish details of exploits, I talk about the arrogance of developers [CACHE] at Microsoft and how this can lead to bugs. This is a good time to mention that I don't get to pick the title of osOpinion articles. My original title was "Developer Arrogance and Buffer Overflows." Gak, I later noticed this got referenced in a footnote in one of the public comments on the DOJ lawsuit settlement. 10.10.01 I consider the possibility that Linux missed its big chance for success [CACHE] against Windows. Microsoft is about to ship an operating system, Windows XP, that was designed after Linux got popular. Linux can no longer benefit from Microsoft's inattention. Check out the 200+ comments if you dare. Various places linked to this article, including Hardware One. No surprise the indefatigable yakkers on LinuxToday also chimed in with some suggestions I was dropped as a child. Meanwhile a high school student reviewed the article for a class assignment. 09.30.01 I wrote an article about The Effect of War on the Economy for an obscure new discussion site called Slant-Six. I submitted it there because I finally got fed up with the quality of discussion on Kuro5hin. So now instead of getting many inane comments, I get no comments at all. 09.18.01 In the wake of the 9/11 terrorist attack, how did the Internet work as a news source? "Was this the coming of age for the Internet as a news source, the moment when it replaced traditional television news as the best source of information in a time of crisis?" 09.08.01 I attended a seminar given by Edward Tufte, in which he discussed, among other things, his ideas on web design, which don't necessarily match those of many graphic designers working out there. 08.28.01 Is it possible that e-commerce could turn out to be a waste of money for everyone [CACHE]? That even a catalog with an 800 number like Lands' End would probably be happier if e-commerce hadn't happened? Read on to find out. 08.05.01 I wrote a review of the book Breaking Windows for Slashdot. "It hopefully shatters, once and for all, the myth that Microsoft is a hive community marching in line behind Bill Gates." 07.18.01 An article discussing subscription software and network lock-in [CACHE]. Summary: Hailstorm won't get lots of subscribers and it won't generate sales of .NET plumbing. I will point out that I got one example backwards: It's not "Imagine if Linux, Mac and OS/2 applications ran seamlessly on a Windows machine," but rather the notion of Windows applications running seamlessly on any operating system, and then trying to use Office to generate sales of Windows, that elucidates my point. Despite this, Dave Winer still linked to this. UPDATE 04.11.02 Microsoft has evidently nixed Hailstorm. Along the way it was renamed My Services and then eventually Persona -- but who cares, it's toast for now. 07.16.01 I try to debunk a myth that has persisted for a while, that Microsoft employees wore buttons (or maybe a t-shirt) with the slogan "FYIFV" on them. 07.01.01 Microsoft just decided to remove the Smart Tags feature from IE6, but I have a suspicion that they may be back before too long [CACHE]. 06.23.01 After my book was reviewed on Slashdot, I couldn't help writing a little meta-review on Kuro5hin. As rusty said, "Fluffy? Pointless? Yes! But I thought it was entertaining as hell to read. Anyway, it's Friday night. Crack a beer and vote +1 like it's 1999. :-)". 06.19.01 Here I opine on Microsoft, TCP/IP, Open Source, and Licensing for Kuro5hin. Did I miss anything? This was in response to the Wall Street Journal article alleging that Microsoft was using BSD code inside its TCP/IP stack. It talks about the history of the TCP code Microsoft has shipped, then wraps things up by discussing what Craig Mundie is yapping about when he complains about the GPL. According to this linkfest, the article was written by "someone claiming to have been a Microsoft employee." Lil' devil is from freebsd.org. 06.09.01 More complaining, this time about the general lameness of search engines [CACHE]. NOTE: The "friend" in the article is actually my father, if anyone wants to know. This one also got picked up by our friends at Yahoo!News, but I discovered those links get stale pretty quickly. 05.29.01 Another article for Kuro5hin, this one is superficially about me reminiscing about Eve Andersson, a much admired and drooled-at web figure from back in 1995 (photo, as it were, at left), but in reality it is complaining about how the current crop of blogs are too self-important for their own good. This got linked to by JD Lasica's blog (scroll down a bit). That's one of the good ones, of course! UPDATE 06.20.01 As a result of this, Eve invited me to a talk about ArsDigita in Seattle this evening, so I finally met her. 05.02.01 I posted an article on Kuro5hin, about Linux and Disruptive Technology, based on the book The Innovator's Dilemma by Clayton Christensen. This article was similar to my osOpinion articles, but it was longer than their word limit, which is why I posted it somewhere else. 04.23.01 Spring is in the air in Redmond, and it seems like the sap is running [CACHE] at Microsoft again. This article also got picked up by Yahoo! News. 04.12.01 The discussion about the previous article got me thinking about the Xbox, a powerful machine with built-in Ethernet selling for $300. I decided that the Xbox would make a great web server [CACHE]. This article was picked up by Yahoo! News, which led to a discussion on Slashdot. It was also mentioned on MSXbox, but inspired no venom. UPDATE 01.30.03 Gak! My vision of a stack of clustered Xboxes actually came true. 04.06.01 Is the Xbox a good idea for Microsoft? Independently of whether it will be profitable, I don't think it makes sense [CACHE] for Microsoft. This column generated some good flames when it was posted to the fan site MSXbox (from which I lifted the logo). Unfortunately the article was presented as me criticizing the Xbox as a business model, when I was really criticizing Xbox as a strategic direction for Microsoft. It was also linked to by ConsoleWire, Fun Xbox, and Daily Radar (third item down -- they actually summarized my article reasonably well). My offhand comment that Linux users should buy an Xbox to hurt Microsoft generated some discussion on LinuxToday. 03.26.01 My new idea, inspired by Microsoft's limited release of its source code, is that every company should provide read-only source [CACHE] to its software. UPDATE 05.03.01 Has Microsoft been reading my stuff? 03.14.01 Here I am complaining about themes [CACHE] aka skins. (Picture is from skinz.org.) "A nice rant" says the giant ant. This article was mentioned by Adam Gaffin in Network World Fusion (fifth item down), which in turn led to an entire column by another NWF columnist, Mark Gibbs. Gibbs disagreed with me, but he did mention the book. For some reason, that particular column of his is not online. UPDATE 03.06.02 My article only generated 33 comments, but almost a year later, a very similar article [here's a copy from the Wayback Machine] (in fact r-e-a-l-l-y similar) by osOpinion honcho Kelly McNeil generated over 400 comments, most inquiring about the size of his brainpan. This led Kelly to do an interview with Jef Raskin supporting his point, which led to a "Can't We All Get Along?" article. 01.23.01 Beyond the PC? Bah! Just a side effect of the dot-com revolution [CACHE], I say. 11.27.00 This is a discussion of the Napster-Bertelsmann alliance [CACHE]. Should they be allowed to define a standard for digital music distribution without any outside input? 11.16.00 Here I give my prediction on What Microsoft's .NET could be [CACHE].